~ This blog is about expats and rugs not drugs. 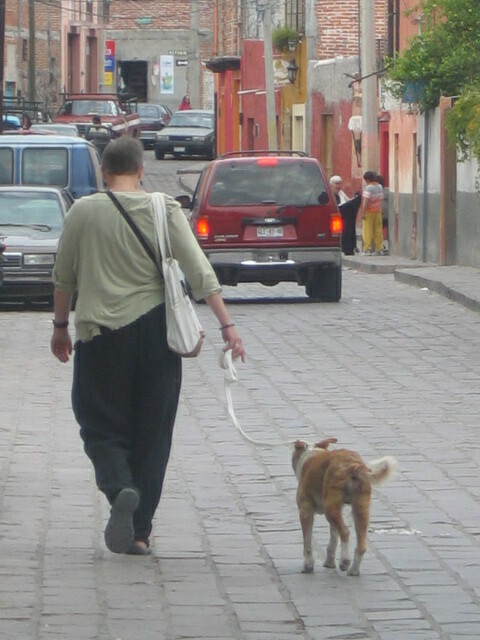 Dogs are very important in San Miguel. With a ratio of six single women to one man, the next best alternative is a dog. Living alone changes people but living alone with a dog changes them even more. Dogs provide structure to life. They can take an aimless life and give it purpose. Walking the dog fills many hours. 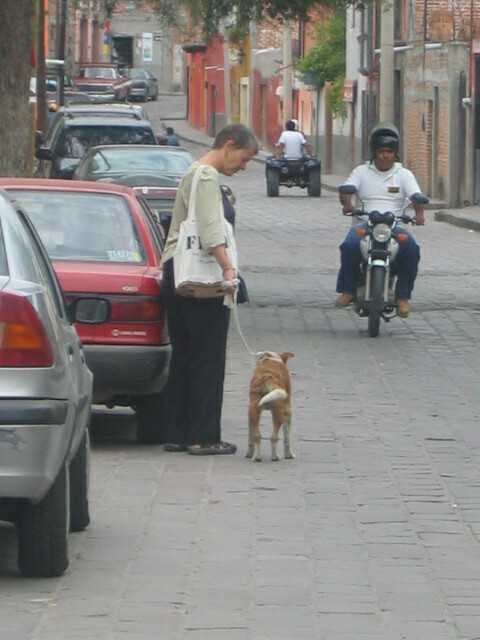 But walking the dog requires intuitive listening. Dogs can sense if a single man is about or if new products have arrived in a store or if a boring friend is close. A good dog owner listens. 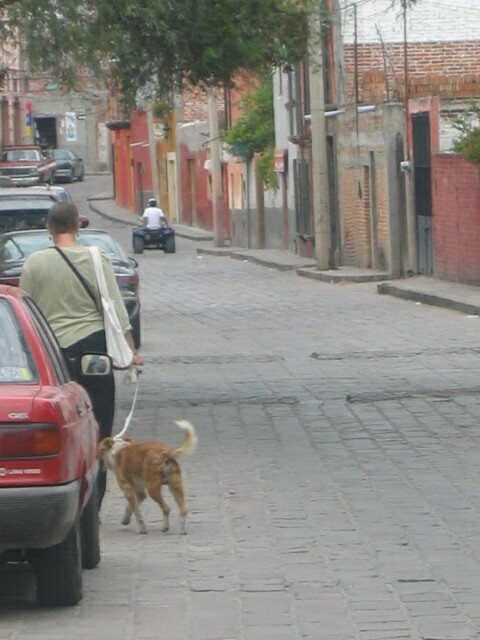 This dog can sense danger ahead and has alerted his owner to what is around the corner to the left. He knows that the dreaded Emma Simpson is coming up 28 de Abril from her Yoga Class. He knows Emma upsets his owner, with her talk of renovating her big house. He knows his owner is sad because four divorce settlements have afforded her only a very small house that is not in Centro nor with a view anyone would want to see. He doesn’t want her, tonight, to open another bottle of wine and put on that Barbra Streisand CD, so he alerts her to the danger ahead. She knows that Albert is looking out for as no man has ever looked out for her and moves off the calle and follows Albert onto a side street. She doesn’t know Emma is near but trusts in Albert’s love of her and the bond they have developed in such a short time. Dogs are a woman’s best friend. Trying to leave Zimbabwe before Global Warming gets it’s teeth in & there’s no water even in my well, (haven’t had municipal water for years), & there’s limited electricity. I got stranded here whilst on a 2 year contract:- my sister in England sold the family house. I was born in Argentina of British Polish parents & they tried emigrating to Argentina after the war. I don’t speak Spanish, but have a solid BA in Art & Design & have worked as a commercial artist all my life, until the farm invasions started & most of the ‘Euros’ have left. ‘Lying, stealing & cheating’ is pretty much the way here, so I’m well groomed for Mexico. Hopefully there are more Euros, tho after reading your article, it looks depressingly similar. Hopefully there is better water & electricity, tho you did mention candles several times so I’m assuming they have the same problems. okay this was one of the best. I think this was the first of the ” take a picture then make up a story” series. They really got your creative juices flowing especially after a bottle of wine and a boring dinner party. They were good stories. Reblogged this on Gangs of San Miguel de Allende. To other readers… if you lose your poodle – I won’t help nor your purse nor your husband nor your debit card nor your maid..
That may explain why my dog is more than willing to lead me into the path of a speeding bus. He is looking for a woman with whom he can have a meaningful relationship — rather than living like two Norwegian bachelor farmers. Life Style Refugee – Honey, what the hell are we doing in Mexico?